The militant group Shuhada al-Islam Brigade announced on Tuesday 5 June its integration into the Free Syrian Army's faction Faylaq al-Sham which operates in northern Syria. Shuhada al-Islam, which used to be based in the town of Daraya in Rif Dimashq Governorate before being displaced to Idlib, said in a statement: "We announce our integration into the ranks of Faylaq al-Sham. We ask God to unite the forces of the Mujahidin". 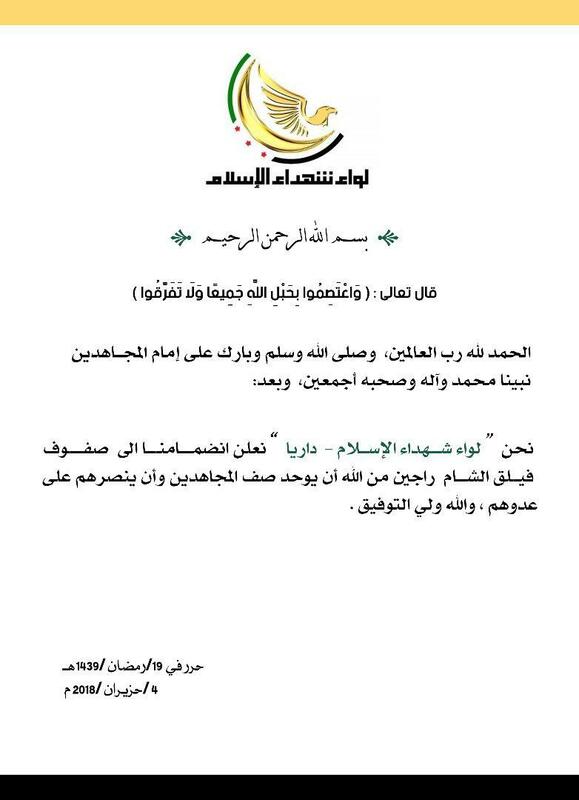 Faylaq al-Sham welcomed this step, saying that "it is important because the sphere of Mujahidin needs to be united in its ranks and voice". Shuhada al-Islam's integration into Faylaq al-Sham comes around two years after the group's displacement to Idlib. The faction has since not participated in any military campaigns, excepting for the participation of individuals fighters in battles in Hama and Latakia. The Shuhada al-Islam Brigade had recently joined the recently-formed military body the National Liberation Front with several other prominent factions in rebel-held northern Syria. The faction's previous leader, Captain Said Naqrash, was recently abducted from his home in the town of Sarmada in Idlib Governorate. The actors responsible for the abduction remain unknown.